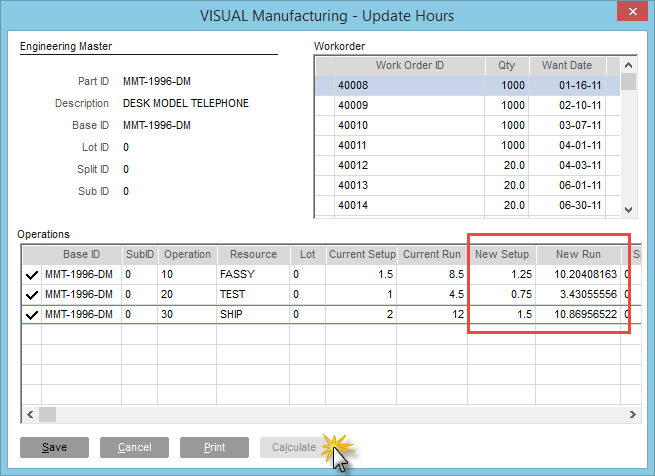 Did you know that you can get more accurate scheduling calculations and better estimated costs for future jobs in Infor VISUAL by moving labor hours from your Work Orders into your Engineering Masters? Often times, the hours in a company's Engineering Masters are less accurate than the time being recorded on the work orders. You can easily move the calculated labor hours from your Work Orders into you Engineering Masters. This can provide more accurate scheduling calculations and better estimated costs for future jobs. 1. Open the Manufacturing Window in Infor VISUAL and open the Engineering Master you wish to update (you must have an engineering Master open to continue). 2. Now, from the EDIT menu, select UPDATE HOURS. 3. A new window will now display the list's Work Orders that were created using the Engineering Master. 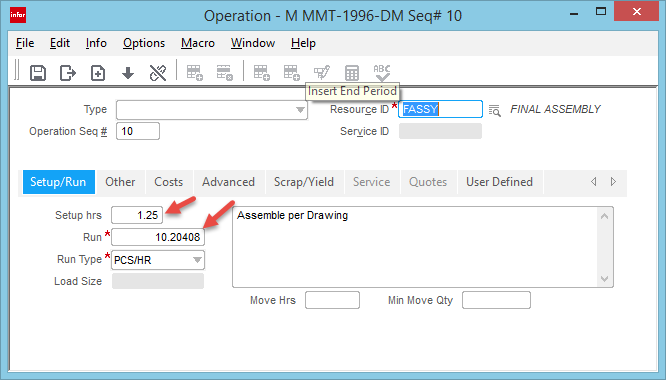 Select one or more Work Orders that you wish to use to update the Engineering Master. 4. Hit the CALCULATE button to see the New Setup Hours and New Run Hours. 5. Your Engineering Master will now be up-to-date. To move these costs into the finished part, you need to Implode the costs from Part Maintenance.